It is a glorious spring day. I have walked out to Outlet creek from the Harc 4 gate, around the south end of a small oak woodland we call Lusher. The Giant white wakerobin, Trillium allbidium, are in bloom here with Meadow Rue and Milkmaids everywhere. After taking many photos I am ready for lunch and head for a soft grassy knoll above Outlet Creek. This gives me a view of the creek below and the small wetland pond to my left. 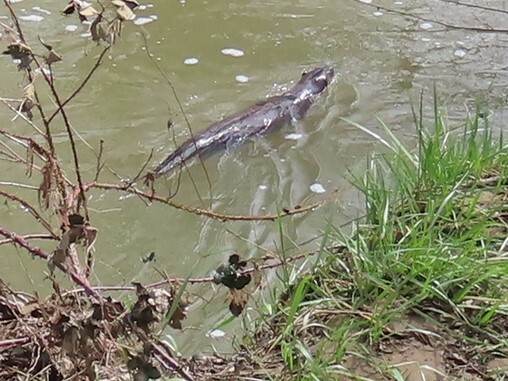 As I get my lunch out I hear noisy splashing and suddenly, there is a Northern River otter, Lontra canadensiss, running directly towards me. It is so shocking, I do not have time to grab my camera. Then I think that making any fast motions might scare this delightful creature away. It halts abruptly and sniffs the air. I take in its length, about the size of my dog Rudy but of course sleeker and longer. Its thick durable fur is dripping water, and I get a good look at its sleek muscular body as it runs across the bank with its humped loping gait. 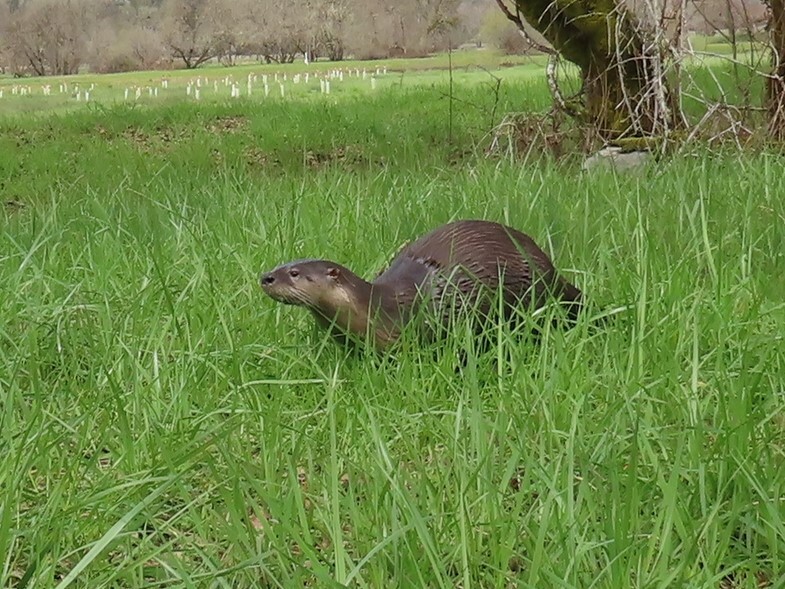 I hear another splash behind me as this otter takes off down the hill to the creek. Incredibly, in the next moment, a second otter runs toward me! This time I am ready for it and begin taking photos. Number 2 barely hesitates and lopes right past me, chasing the first otter into the water. Is this an elaborate mating ritual or just playing? It is hard to know. I just happened to be sitting in that spot at that time or I would have missed the whole experience. 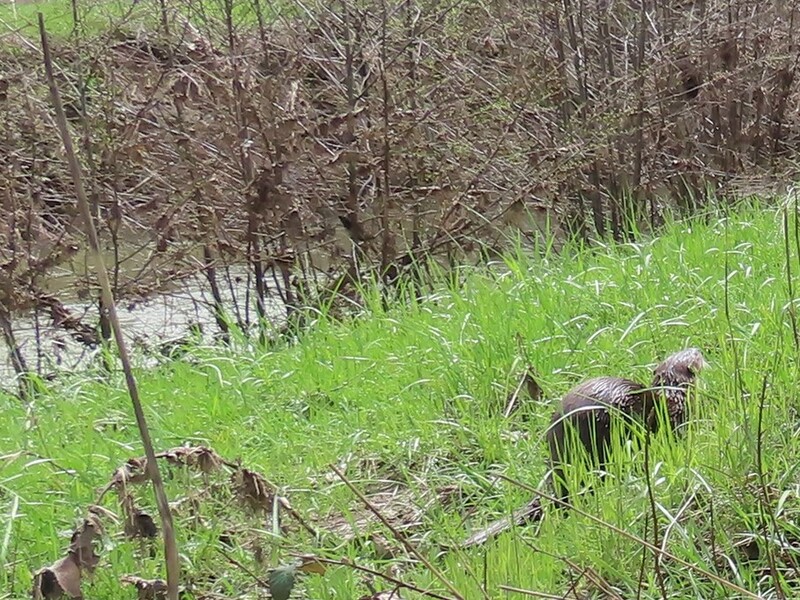 It was exhilarating to have been that close to two otters on land. I have seen them in this creek many times swimming past or busy hunting clams under the water but this is the first time I have seen their playful nature in such close proximity. Today they were chasing each other out of the creek and around a grassy knoll! Here are some facts about the Northern River Otter. Their total length is from 3 1/2 to 4 1/2 feet long with a tail length of 12 to 20 inches. They weigh 10 to 24 pounds. Playing is something they love to do, creating slides on banks of grass or mud which they take turns sliding down. They are social animals and frolic together in the water. I have seen as many as 6 in a group hunting for crawdads in the late spring. The last few times I have seen just 2 together, working the bottom of Outlet creek or floating past me,using that rudder like tail, with exceptional ease in the water. Their webbed toes and valved nostrils and ears help them be the diligent and efficient hunters under water that they are. They can hold their breath for as long as 5 minutes which explains why sometimes it seems they disappear under the water and don’t come back up! A river otter is a able to make extensive cross country journeys and can outrun a human with its humped, loping gait. It is important to remember that the Northern river otter is a weasel related carnivore and will protect itself and its young from another predator. 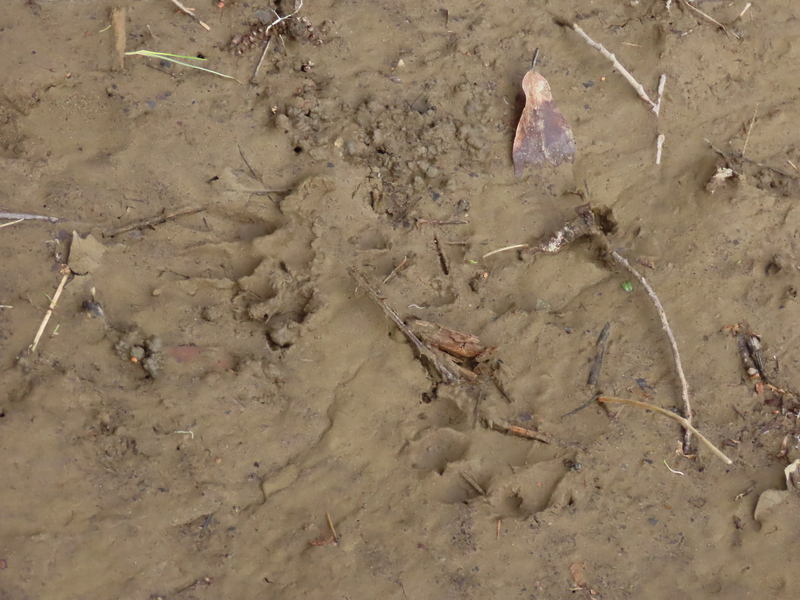 This was shown to me when my old hound dog decided to chase a river otter on our creek. He jumped in the water after it, only to come quickly out of the water howling when it bit him in the tail! It is time for me to walk back and I think about how wonderful it is to spend time observing animals in their home environments.